In my humble opinion, this release is the absolute pick of the fantastic Skankadelic litter. Indeed, every Skank release is great, even the weakest link (Skank 008 by my estimation). 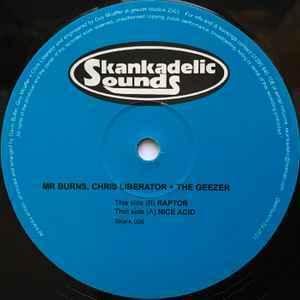 And it should come as no surprise that adding Chris Liberator to the already potent duo of Mr. Burns and the Geezer produced two acid-techno masterpieces! Anyway, of these two thumping and wonderfully acidic beasts, my personal favorite is "Nice Acid." The track possesses a bit of acid-attitude, almost like Samuel L. Jackson should listen to it in a Tarantino film (I know that's a bit of a stretch!). Plus, it exudes a frantic tone, largely the product of a recurring and washed-out scream noise in the background. And just when you think the track can't get any more incredible, in drops the trademark Skankadelic acid-solo at about 6:20 to prove you outrageously wrong. What a slamming tune, 5/5 twenty years from now. On the flip, we get Raptor, more of a dark rumbler, but also replete with boat-loads of acidic delight. Like all Skank tracks, this opens with a long, minimal, and DJ-friendly intro, but at around 1:40, it reveals its acidic hand. At that point, a heavy, rumbling bassline begins to cycle, churning your brain and compelling your feet to start moving. When the next acid layer drops in at 2:30, you realize you should probably be closer to the speakers, as acid madness is surely just around the corner. And no doubt, when the main drop occurs at about 4:15, any person not in love with pounding acid techno should probably run for cover, because the track just storms along with no frills or apologies after that. When the Skankadelic acid-solo drops in this one (at around 5:30), what can you do but grit your teeth, close your eyes, and rock the hell out? Not much.